Lilli has a home! - Rocky Mountain Great Dane Rescue, Inc.
Lilli has a home with her foster family Audra in Colstrip, MT. 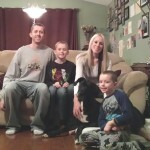 Audra and her family are new to the breed and excited to have a Dane in their home. Audra is a stay at home mom and ever since her lab passed; they have felt an absence in their home that only a dog can fill. They have always admired Great Danes and felt what better way than to rescue one. Lilli has blended so well with Audra and her family that they can’t imagine a life without her in it. Happy Days ahead! Way to go Lilli.